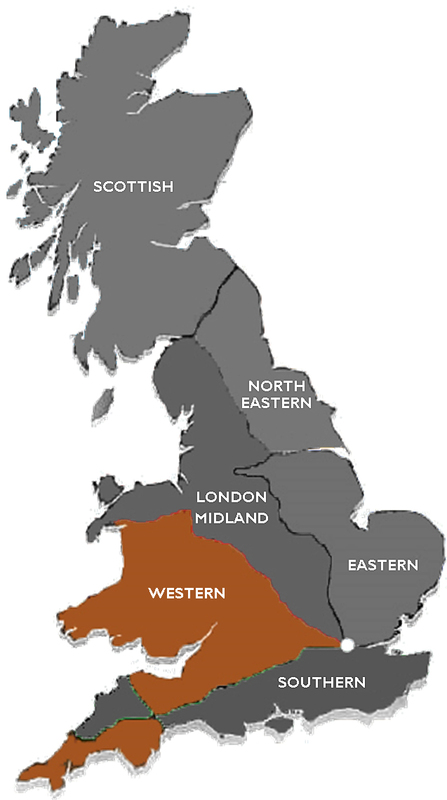 The Western Region was a region of British Railways from 1948 and consisted principally of ex-Great Western Railway lines, minus certain lines west of Birmingham, which were transferred to the London Midland Region in 1963 and with the addition of all former Southern Railway routes west of Exeter, which were subsequently rationalised. The region ceased to be an operating unit in its own right in the 1980s and was wound up at the end of 1992. Want to be Property of the Month? Your property could be featured here. This former railway station in Ballingham Herefordshire, is tucked away in its own private plot, allowing guests to enjoy a private and peaceful setting. The pretty, enclosed gardens are formed on and below the old platform, enhanced by a separate meadow. A patio with BBQ offers a lovely place to sit and enjoy the gardens. A private driveway leads to an ample parking area. Three bedrooms (1 en-suite) each with a double bed provides accommodation for up to 6 guests. Set in the scenic beauty of the UNESCO World Heritage Site of the Ironbridge Gorge, Coalport Station is one of England’s most unique holiday destinations. Formerly part of the Severn Valley Steam Railway line, today it hosts two fabulous railway carriages offering award-winning accommodation. We were two stops away from Bridgnorth a mere 8 miles as the crow flies. The renovated Mk1 carriages still wear their traditional GWR livery with pride, but on the inside they offer everything for the modern luxury self-catering experience. Bodorwel Cottage is located in upper Penrhyndeudraeth, it dates from the early 1800?s. Formally associated with a local forge, it now provides a comfortable base for exploring Snowdonia and North Wales. Bodorwel’s key attraction is it’s location beside and under the Ffestiniog Railway. The railway literally runs along the garden wall, words and pictures do not do the experience of a steam train going by justice! Station House is right alongside the Llangollen steam railway, giving you the chance to travel by train to the nearby towns of Llangollen and Corwen. The accommodation is up to date but recognises the railway heritage in its’ decor. Enjoy the comfort of a Pullman armchair and check the time by the railway clock! The beds have all high quality mattresses for a good night’s sleep and the sitting room has a cosy, warm feel whatever the weather. This two-storey apartment is set in the heart of Lostwithiel, with plenty of cafés, pubs and the railway station just a short walk away. This two-storey apartment is situated within an architect designed house on the site of an old heritage railway building, once a part of the Great Western Railway empire designed by Isambard Kingdom Brunel. Isambard’s Retreat is named after the engineer who brought the railways to Cornwall, and occupies the top two floors of this impressively designed property, the finish of which is second to none and provides a stunning holiday home in the middle of the ancient Stannary town of Lostwithiel which spans the River Fowey. The Lostwithiel Railway Apartment is part of the new Brunel Two development, being constructed by a local award-winning developer. Built to an exceptionally high standard, it offers 21st century living in Cornwall, is in an excellent location for visiting many local attractions either by car or train, and yet within a stone’s throw of Lostwithiel, a charming and historic Cornish town with much to discover. Platform 3 at Station House Malvern is located within throwing distance of the active line at Malvern Link Railway Station. The property has undergone massive renovation and is now operating as a 5* holiday letting brimming with unique features. The upstairs of the property comprises of a fully equipped state of the art kitchen, open plan with dining room and living area leading onto a fabulous floating balcony with seating area to create the ideal location for watching the trains from a unique position! The Railway Carriage is a purpose built Railway Carriage/ Brake Van next to the West Somerset Steam Railway. The Railway Carriage provides a unique and memorable holiday location. The views from the Railway Carriage are stunning lying close to the railway line itself, what could be better for either children of all ages than the magnificent steam locomotives passing by. You will not tire of seeing the beautiful steam trains pass by your holiday home. Located in the rolling hills of North Herefordshire, Rowden Mill Station is a restored GWR railway station on the former Leominster / Worcester line. Externally the restoration is done in exacting detail, recreating the look of the station during the latter years of operation and features platform lights, signboards, timetables and posters of the late 1940’s / early 1950’s. The site includes several hundred metres of double track, two platforms and much more by way of recreated detail. A seaside Victorian railway carriage near Patch Beach, Gwbert on Sea, Ceredigion. KITCHEN/DINING ROOM: Range of units, electric cooker, fridge (with freezer compartment), washing machine, microwave oven. DINING AREA: Dining table, 6 chairs. Station Cottage is a recently renovated Victorian railway building. Offering cosy accommodation for up to 4 guests, it is a perfect base for travelling the Heart of Wales line, walking and cycling (road and off-road). Station Cottage Bucknell is a dream destination for railway lovers young and old. 8 trains a day pass slowly, and quietly, through the station with the conductors and drivers always happy to share a friendly wave. In a superb location between Snowdon and the waters of the mile long Llyn Cwellyn, this unique former railway station opened in 1878 when North Wales Narrow Gauge Railway was built. Today, during the summer, up to three trains pass each way daily on what is now the Welsh Highland Railway, travelling between Caernarfon and Porthmadog. The trains are pulled by the largest two-foot gauge steam locomotives in the world – and, on request, they stop at the Snowdon Ranger halt. Doldowlod Old Station Caravan Park is a great destination for railway enthusiasts. As well as original railway features such as signals, re-laid track and vintage carriage restoration projects. We are ideally located for visits to both main line and heritage railways. Located 200 yards across a meadow from the River Wye, this Cambrian Railway Box Carriage has been converted to a very high standard for use as a self catering accommodation. Welcome to Wiltshire’s only original 1940’s Railway Carriage which has been lovingly refurbished to provide a quirky space with kitchenette and en-suite. It is nestled in the paddock of a former dairy farm beside the London to Bristol main railway line. Railway enthusiasts will have an absolute ball here as we’re just up the road to STEAM – Museum of The Great Western Railway which now boasts a working replica of the town’s Railway Works hooter. Doldowlod Old Station Caravan Park is a great destination for railway enthusiasts. As well as original railway features such as signals, re-laid track and vintage carriage restoration projects. We are ideally located for visits to both main line and heritage railways. Located on rail next to what remains of our down platform, this 1940’s LMS Railway Guards Van has many original features as well as some sensitive additions to enable it to be a comfortable self catering accommodation.